“I am one with the Force, and the Force is with me,” he intones. And then he beats up everyone. Chirrut Imwe (Donnie Yen) makes a heck of an impression when he gets his first action sequence in Rogue One. Despite being blind and only wielding a staff, he’s one of the toughest characters in the whole movie, wrecking Stormtroopers left and right. Combining that prowess with Chirrut’s general sense of ascetic mystique is what makes him such a fan favorite character. (Well, that and his adorable relationship with gun-toting Baze.) 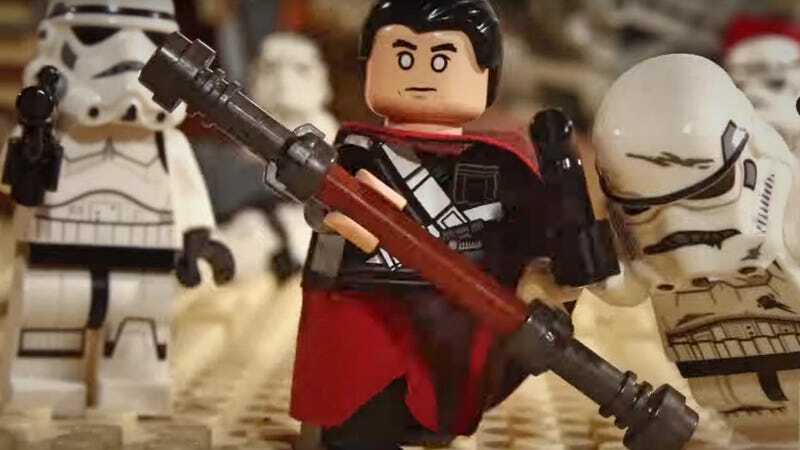 In a new parody video, How It Should Have Ended team up with Lego animators Brotherhood Workshop to pay homage to Chirrut’s excellence with a heckuva showcase of his martial prowess. Which is to say, as the title so eloquently puts it: get ready for “Chirrut vs Everything.” Think he can’t take on the whole Empire by himself, with nothing but a staff and his faith in the Force? Think again. According to How it Should Have Ended, this video started as a two minute short for the South by Southwest Game Awards this spring, but they later extended it to its present form at just over four minutes. It’s a brilliantly choreographed bit of stop motion, beginning with something pretty similar to the fight we got in Rogue One before escalating. A lot. You can watch it below.